“So what’s your game about?” She asked. I couldn’t move. Couldn’t talk… I was frozen. “Um, uh, ahh…” I stumbled. This is embarrassing. Why would she ever want to sell my game if I can’t even talk? I knew everything about my game and had playtested it 276 times (rough estimate) but I couldn’t answer Sarah’s simple question. Don’t get me wrong. I had assumed that I would be able to answer this question easily had she not asked. But when a potential buyer is in front of you waiting for a reply, it’s much better to have practiced how to deliver a great pitch. As an aspiring game designer you’ll get asked “What’s your game about?” A LOT. And you need to be ready to answer it. The answer to this question is your pitch. Specifically, this is your short elevator pitch. The goal of an elevator pitch is to gain interest in your game. For a board game, generally 15-30 seconds (3-5 sentences). That is often enough time to discuss the important information about your game. Remember, you are simply trying to spark the audiences’ attention. Either the person listening will like it or not. What information about my game should my pitch contain? Here is what I have learned through studying hundreds of designers’ pitches. 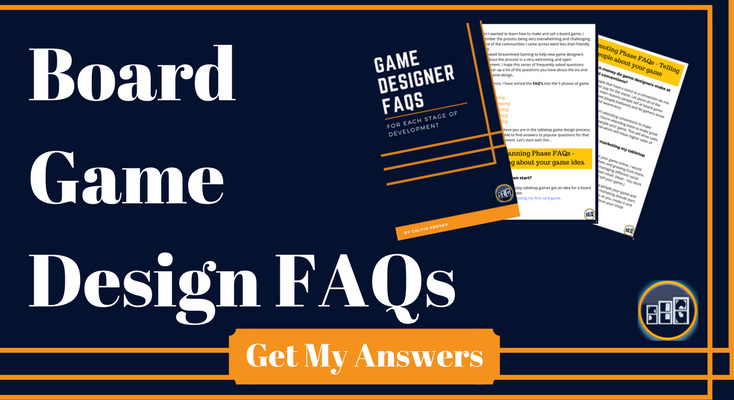 I have heard them from established game designers at conventions (PAX, Gencon) and read them from both first time and established designers online (Facebook groups, Reddit, BoardGameGeek). Target Audience – Who will like playing your game? Wow Factor – What makes your game unique. Even if your wow factor is obvious, you should state it. Publishers love hearing this. I talked about most of these elements in more depth already. But by simply putting yourself in the shoes of your target audience, think about what elements of your game will be most interesting. Emphasize those elements of your game to the person you are pitching to. Do they like short games? Then tell them how quick your game is. Are they looking for a game that can be played by a large group? Tell them how perfect your new party game is for a lot of people. What is the Goal of Your Pitch? To Get Published – If you don’t think this is nerve wracking, then you are a robot. Talking to publishers is very hard as an aspiring game designer. Asking (begging) them to spend 1000’s of dollars to create and try to sell your game is even harder. It’s best if you are prepared and have a well thought out pitch days before talking to a publisher. You will thank yourself. To Sell your game – So this could mean pitching your game to a Kickstarter audience. Or it could mean convincing someone like Sarah (distributor) to buy a lot of your games at a discount and sell them. When you pitch to playtesters and publishers, it is usually face to face. This is harder for me than it is if I were to pitch to an online audience because I have time to lay out my thoughts. Maybe you are different and are awesome at delivering a great pitch in person. But in either case, practice makes perfect so try and pitch to yourself in the mirror or grab a friend willing to listen and give honest feedback. The audience goes hand in hand with the goal of your pitch. A lot of game designers (my younger self included) don’t realize the importance of pitching your games to potential playtesters. This is a big mistake. Learning how to deliver a great pitch is crucial for a couple of reasons. It will build up excitement for your game – Other people get excited when you are excited. This is basic human nature. And the same is true when experiencing how to deliver a great pitch. It will target the appropriate testers – You don’t want someone that hates deck-building games playtesting your deck-building game. At best they won’t be buying your game and will provide poor feedback. Or at worst, they will discourage you by acting bored and/or telling you your game is bad. What types of games do they typically publish? Who is their target audience? 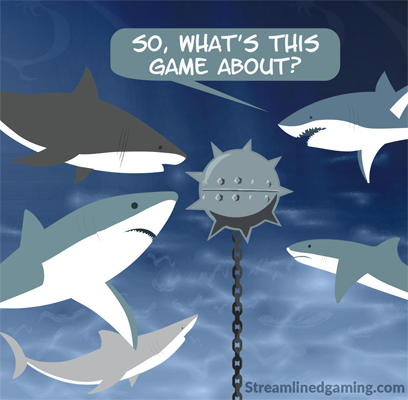 – Does it match your games’ target audience? Are you willing to let the publisher alter your games’ theme? – A publisher may enjoy the way your game plays, but want to add their own theme (and art) to match their collection of games. This is more common than you may think but is a topic that you should be prepared to respond to. Again, if you are selling the game yourself (Kickstarter or your own website), then you will need to know how to pitch to your customers (target audience). Who do you think will buy your game? When you are improving how to deliver a great pitch to your customers, keep these people in mind as you write and edit your pitch. When I first was learning how to deliver my game pitch, I thought a “1 pitch works for all” would be good. Unfortunately, that is not the case. For a great pitch, you must customize it based on several items such as your audience and goal. Don’t be afraid to practice in front of a mirror or with a friend/family member. Think back on those dreaded nights before you were to give a speech in your communications class. It was tough! But remember how much harder it was when you didn’t practice? Apart from this post, are there lessons you have learned on how to deliver a great pitch for your game? Help your community out by giving your expertise in the comments below.